Northumbria Police is investigating an alleged incident involving England goalkeeper Jordan Pickford. Video published on social media appears to show the Everton player, 25, involved in a fracas on a street. Everton had earlier confirmed that they are also investigating. The FA is aware of the incident but it is seen as a club matter. 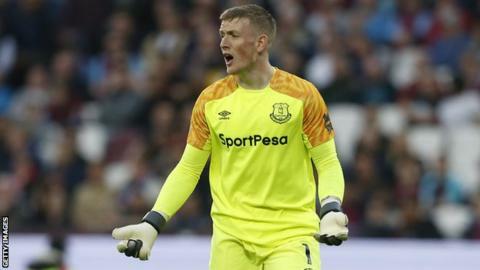 He became the most expensive British goalkeeper in history after Everton paid £25m to sign him from Sunderland in June 2017. Pickford won the first of his 17 England caps in November 2017 and went on to secure the number one shirt. At the 2018 World Cup he played a starring role as England reached the semi-finals for the first time since 1990. His save from Carlos Bacca against Colombia in the last-16 match helped England win a World Cup penalty shootout for the first time.